The irony is that those who'd want to destroy certain memories can't afford to do so, and those who can afford it - well, they're too busy sipping on dreamwine. Fantasy Flight Games is excited to publicize the 2016 Android: Netrunner National Championship Prizes! With its fantastic prizes and tremendous field of competitors, the Android: Netrunner National Championships are a vital part of the Championship Series, and will be a proving ground for those who plan on attending the 2016 Android: Netrunner World Championship. International events will be taking place around the world in August and September. International players can check our list of 2016 National Championships to find out more information on a National Championship near them. Do you think you have what it takes to end a pesky Runner's infiltration into your servers? 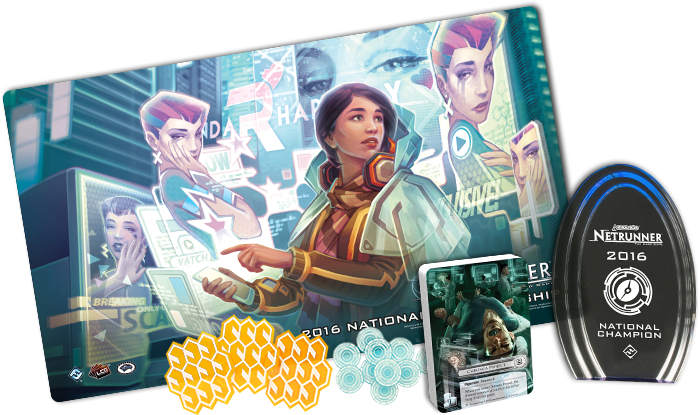 Doing well at a Android: Netrunner National Championship will reward you with a variety of exciting prizes to show off your success. 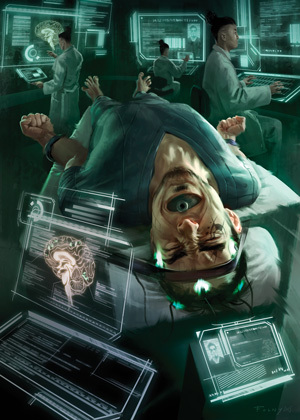 First Place: The winner of a National Championship receives a first-place trophy to show off to their family and friends, and a first-round bye at the 2016 Android: Netrunner World Championship. A first-round bye will give you a big advantage over the fierce competition at Worlds. Top Four: The top four players each receive a set of acrylic 10 Credit tokens, allowing them to show off their wealth with some flair. Top Eight: The top eight players each receive a beautiful playmat with art from the card “Media Blitz”. Top Sixteen: The top sixteen players will be able to mark their progress with a set of advancement tokens. Top Sixty-Four: The top sixty-four players each receive one copy of the alternate art card Chronos Project, a tactical card against Runners who like to reuse their cards over and over again. In addition, the winner of a National Championship will earn a reserved spot at the 2016 Android: Netrunner World Championship this November! The National Championships follow Regional Championships in the Organized Play calendar and are the next level in competition, prizes, and prestige. A National Championship is representative of the competitive communities within a nation and throughout the rest of the world. These events are not exclusive to specific nationalities, and a National Championship is welcoming of all challengers who would compete for the title. The National Championships will have unique prizes that will not be available elsewhere and ownership of them will definitely make a player stand out in the field of competition. For more information, you can read our article on the Championship Series. What Tournament Tier and Structure Will Be Used? Custom Tournament Structure: A National Championship is a reflection of the competitive communities within and around various countries spanning the globe. Each National Championship is as unique as that nation itself, so each organizer will determine the unique custom tournament structure for their event. Over the next few months, competitors will attend 2016 National Championships in an attempt to win these attractive prizes and upgrade their servers. Don’t miss out on your chance to acquire some of these prizes for yourself and add them to your collection!